Lily waved until her parents were out of sight. A chill carried by the wind floated through the open window which she closed. Looking round it seemed Hugo had already traveled down the train to find a place to sit. He was nowhere in sight. Lily managed to pass people without annoying them to much. Looking through windows she wondered whether Hugo was with Rose or anyone else she knew. As she looked through a window someone bumped into her. "Sorry!" Said the boy who had pushed her to the floor. "Didn't she you there." He helped her up. He had amazingly bleach blonde hair and grey eyes that seemed empty yet happy. "It's not a problem." Lily muttered very quietly it was a mirical the boy even heard. He had a smile that seemed put on, yet happy. "I'm Scorpius." He said,holding out his hand for Lily to shake. They shook hands, it seemed a bit awkward. "Lily." She said, still quietly. "Um, do you have a place to sit?" Scorpius asked her. "I'm sure my friends would let you join us." Lily knew that wasn't true. No one wanted a first year to sit with them. "I'm going to sit with my brothers." Lily said, a bit more loudly. She wanted to get away from Scorpius, quickly. There was something about him. "Oh. OK. I'll see you around then." He said. Lily nodded and moved past him, glad to be away from the Dead But Alive boy. Finally she found a perfect carriage. James, Albus, Rose and Hugo were all sitting in it. No one else. "Where have you been?" James blurted out as she slided the door open and close. "I bumped into a boy called Scopius." Lily answered, sitting down next to Hugo who was opposite James. "Scorpius?" Albus asked. "Scorpius Malfoy?" "I don't know. He had bleach blonde hair and scary grey eyes." "Yep. He's in my class. We're the only two boys in Slytherin in our year. I never talk to him though. I normally stay by myself." "Well that's what you get for being a Slytherin." James joked. Hugo started to laugh. "Well don't talk to him." Rose said as her brother quieted down. "Dad said not to mix in with him and his mates." "He doesn't have mates. He's an outcast like me." Albus told them. They sat in silence. Lily looked out the window at the counrty passing by. It started to feel like blur and she need air. "I need air!" She said as she stood up and walked out the carriage. She walked back up to the window were she had wvaved to her parents, knowing that it opened. She kept walking, determend to get to the window until she saw something she never thought possible. There stood a confused boy and when he looked towards the owner of the voice that called his name he was even more confused. "Lily?" asked Archie. He had blondish ginger hair and was short for his age. "What on earth are you doing here?" "I've know I was a witch all my life!" She said. "I thought you were just a boy from the local village!" "I thought you were just the strange girl who got homeschooled!" He said. They were smiling. Huge grins spread over their faces as they looked at each other. "Come on. You can sit with us." Lily said, walking back to her carriage. She didn't need air anymore. "Us?" Achie asked a bit nervous. "Me and my brothers. And cousins. My whole family are witches and wizards! Well apart from my Uncle Dudley." Lily said, leading him to her carriage by the hand. When she got there she made sure Archie wasn't in sight as she opened the door. "Are you feeling OK?" Albus asked. "Alot better now. Look who I found wondering the train!" She pulled Archie into veiw by the sleeve. James and Albus' jaws dropped. "Who's this?" Hugo asked. He wasn't looking as impressed like James and Albus by Lily's find. "This" Lily started. "Is a boy from our village. A Muggle boy!" "Well he can't be that Muggle if he's on this train." Rose joked. "Oh, how foolish of us." James said in a posh voice. "Muggles are people who do not have a drop of magic in their blood. Non-magic people for short. Muggels for even shorter. I feel so foolish!" "So do you know anything about Hogwarts?" Rose asked. She smiled but Lily could see it was fake. Did Rose not like this boy? "No." He said, quite surprised by the sudden question by this stranger. "Well there's four houses that you get sorted into tonight. 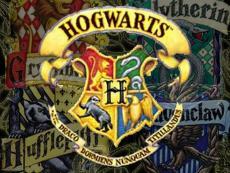 Me and James are in Gryffindor, Albus is in Slytherin." "I still don't see how he got in there." James interupted, looking at Albus. "No one else in our family is in there." "It's because I was named after a Slytherin!" Albus argued. "Severus! And dad said he was the bravest man he ever knew!" "Then how come he wasn't in Gryffindor!" "I don't know!" Albus looked out the window in a huff. No one talked until they heard a faint "Anything from the trolly?" She wasn't quite at their carriage but they all took out some money, apart from Archie. "Anything from the trolly?" The woman asked at the door. Lily got up first and looked through the sweets. "Wow." Archie said. "What type of food is that?" He looked at Rose's pile of money in her hand. "And what type of money is that?!" "Well Archie." Said Lily. "Look's like we have alot to teach you." Voundbah! Wonderful! I love it! Ahhh!!! This is so great!!! Definitely keep me updated!!! I'm thinking about writing a HP fanfic of my own, but I don't know if I'm going to do it yet! Anyway, please tell me when you update!!! i will! don't you worry. it's always nice to have people really like your work. This page was created in 0.3949 seconds.